MILWAUKEE - During prime time Tuesday, you can look forward to pair's figure skating, women's alpine skiing and men's snowboarding. With all the excitement for Team U.S.A., your child may be eyeing a winter sport. Scandals rocking women's gymnastics or the recent biopic "I, Tonya" may make people weary. A three-time Olympic athlete shared how speed skating changed his life. Mike Woods says training to be at the top level is brutal, but it gave him the stamina to get through medical school and become an anesthesiologist. "It taught discipline," said Woods. Dr. Mike Woods showed us his 1984 Team U.S.A. jackets. Getting there was not easy. "It's harder than it looks," said Woods. He says it took years of dedication to earn his spot in the 1976, 1980 and 1984 Olympics. It all began when he was scouted as a child on a pond in Cudahy. "I went in a county race and somebody from the West Allis speed skating was there," said the three-time Olympian. He fell in love with the sport, and knew it was going to take a lot of work to get to his dream from there. The Medical College of Wisconsin even granted him a year off medical school to prepare. "Thousands upon thousands of squats," said Woods. So what would he say to a parent who may be a little bit on the fence about getting their children involved? "I cant think of a safer place for a kid to come," Woods said. "Being in the Olympics at almost any level opens doors." 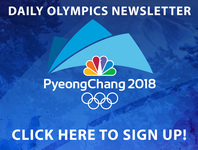 Men's speed skating finals will take place Tuesday morning starting at 10:30 a.m.